Bassist/songwriter Gabriel Roth discovered Sharon Jones sound in 1996, a sound that oozed with the gooey goodness of vintage soul, blues and funk of the 1970s. 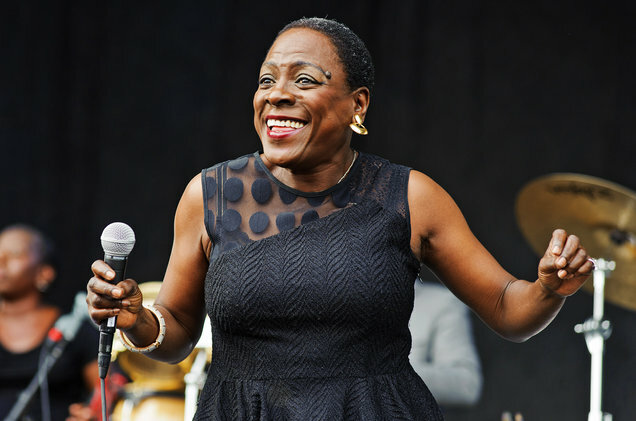 With musical influences ranging from James Brown and Tina Turner to Aretha Franklin and Motown, Sharon Jones recorded a solo track "Switchblade,” a song that had originally been intended for a man to record, and the Dap-Kings were formed. Sharon Jones and the Dap-Kings postponed the release of their second album, Give the People What they Want, following her cancer diagnosis in 2013. She came back to entertain the following year, as the album received a Grammy nomination. Jones passed away on November 18, 2016, at age 60, surrounded by her loved ones and bandmates. Sharon Jones had a gift that was shared with the world. Her soulful and bellowing voice will not be forgotten. Click HERE to read review of filmmaker Barbara Kopple's documentary Miss Sharon Jones by FF2 Intern Peier Tracy Shen. Photo: Sharon Jones And The Dap Kings perform during the 2014 Forecastle Music Festival on July 19, 2014 in Louisville, Kentucky.